The girls asked for a sewing machine for Christmas. Seriously. I had brought out my mom's old sewing machine (like a 1982 Kenmore that weighed 100lbs and made this God awful clunk-clunk noise) back in the spring and we made pillows together. And then they started begging for their own machine. But, I had no idea what a good sewing machine really was, or what would work well to teach kids to sew on, what would last, etc. I didn't want something junky, but I also didn't have $400 or $500 to spend on a machine. 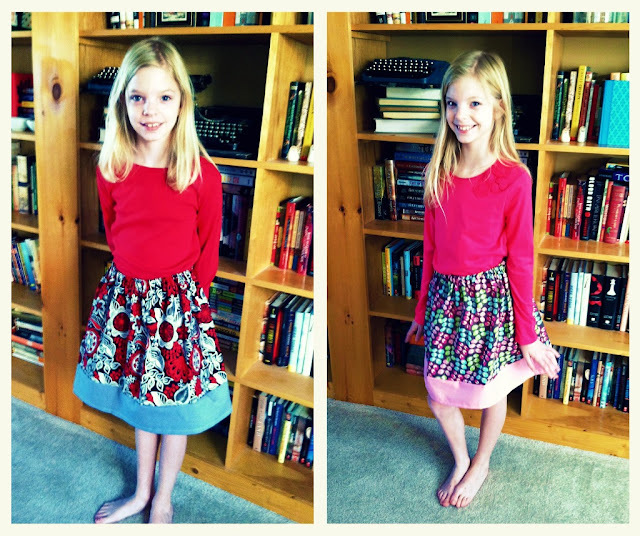 So we did, and then I did, and now two little girls are very happy to have their own handmade skirts! If you haven't heard of Make It and Love It already you definitely need to check it out! She has great tutorials for easy sew projects. I'll be glad to help with any sewing questions/advice... Once Chandler gets the squares together she can easily turn her creation into a quilt. Ang, that is SUPER cool. Can you teach me now, please? And also add sewing to your long list of skills (and Etsy shop offerings)? That would be super. Thanks. These skirts are adorable. Can't wait to see the girls in action with the sewing machine. You guys are such cool parents. Megan - Thanks for the suggestion! Allyson - I really might need you for a sewing day! The girls would LOVE it! Mo - Come visit soon! Love those skirts! You are sooooooo talented!